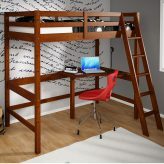 Wooden loft beds with desk make the perfect loft beds for teens. These are the highest loft beds so they allow optimum underbed height. 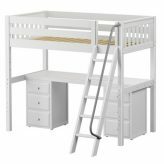 Usually, they are a twin loft bed but they are available in full size loft beds too. Most kids & teens like to sleep elevated but these higher lofts are best for older children. 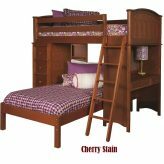 Reconfigure them into single beds or bunk beds if desired. Free up your entire room by using a high sleeper bed. 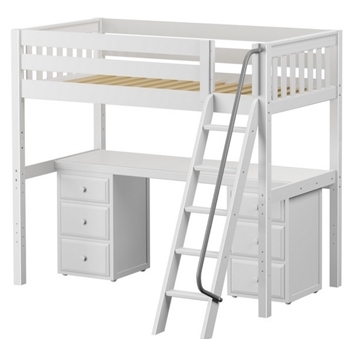 Our wooden loft beds with desk are made of solid wood pine or hardwood. 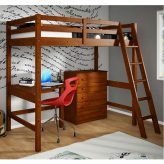 Our best wooden loft beds withstand weights up to 400 lbs per twin bed. 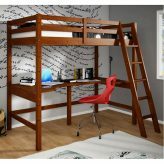 So if you are in the market for teen loft beds, consider our wide selection of wooden study lofts in white as well as rich wood finishes. They all meet or exceed ASTM and CPSC safety standards.